Request a quick quote for any service from this page. (please include your guest total and any special requests, comments or instructions) ~ Thanks! and we will come sit down with you to arrange your interests and begin crafting a personalized party plan for you. the optimum number of player positions and what games to recommend. Over the last decade we have tried it all, and have learned from experience what games and how many work best with what number of guests. Our formula works so well that many of our competitors copy us verbatim. At every party we have ever done there have been assorted accompaniments. Whether there is a DJ or just a coffee bar, guests rarely all gamble at the same time. Some are watching, some are dancing, some are finishing dessert, some are stepping outside, etc., etc..
We experimented with different numbers and there still are some variables, like if you have many guests total but only a few in the room at one given time. The 'rule of thumb' that we follow first is a 70% games-to-guest ratio. For example, if you have 200 guests then 140 player positions is ideal. 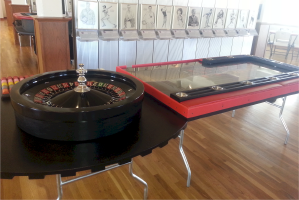 The number of games we provide is ultimately your decision and we will rent you as much or as little as you like. Unless you have specific requests, when we create an estimate for you we will recommend popular games as well as games that may integrate well with your theme. We will of course keep you posted and solicit your feedback along the way. Please feel free to ask for a Complimentary Player Survey! Some of the games we will recommend first will be: Blackjack Spots for around 20% of your guests total as well as Poker Positions for about 20%. We will also recommend other "staples" such as Craps and Roulette. As for Slot Machines, we typically recommend a minimum number of machines equal to near around 10% of your guest total. For example: You have 100 people - we would most-likely recommend three Blackjack (would serve 21 players), a Poker 6' and a Poker 8' (plays 20), a Craps 8' (12), a Roulette 6' (8) and 10 Slots (10): 71 Total Player Positions. We do not require a certain amount of games per number of guests like other companies do- we leave that decision up to you and only provide expert guidance. NEW Problem ;-) It is always good to have a positive dilemma! We have run into a new issue with the addition of such a large variety of games, what games to recommend! We offer so many great games that it is hard to make a recommendation. Not may companies have this problem! The solution that we came up with has been to address any special requests up front and expand on that while following our typical guidelines of recommending popular games. This is done in conjunction with leaving the option open on your quote for substitutions of your choice and listing the other games available in a particular price category. Mini Order Form (below): Use the Quick Quote Form below to get a quick quote now for any Service including the fabulous Pair A Dice Fantasy Casino. We will send you an itemized quote with all costs. You may also email us or Call Us at (316) 755-6303. 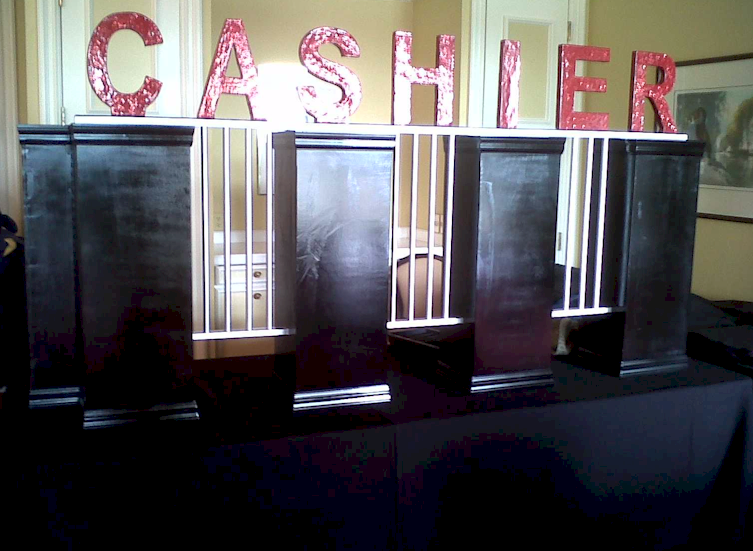 Casino Parties Wichita, Casino Parties, Charity Casino Fundraiser, Casino Equipment and Supplies for Casino Parties in Wichita, Kansas or the surrounding areas. Wichita Fundraisers, Corporate Parties, Holiday Parties or Theme Parties in Wichita KS. Have a Casino Party from Amerifun, among the best equipment in the Nation.